Every once in a while in some war or other there occurs an incident or battle which, although strategically of little importance, has such a dramatic impact that it captures the public's imagination and enters into the history books. Such a battle, or pair of battles since classed as one, took place off the coast of South America and in the South Pacific between 1 November and 8 December 1914. It was the heyday of the battleship and vast surface fleets had been built and deployed by the various colonial powers in the run-up to the First World War (1914-1918). One such fleet was the German Asian Cruiser Squadron based at Tsing-Tau to the north of Shanghai in China. It was a crack squadron of the Imperial German Navy and was commanded by Vice-Admiral Maximilian von Spee who flew his flag from the modern armoured heavy-cruiser Scharnhorst. The other ships in his fleet were Scharnhorst's sister ship Gneisenau, and the light cruisers Emden, Leipzig and Nuremburg. Soon after the outbreak of the war Von Spee's squadron was also joined by the Dresden from the Atlantic. Von Spee's ships were a mixed bunch. The two sisters, Scharnhorst and Gneisenau, were part of a large order of fourteen armoured cruisers as provided for by the Second Navy Law at the turn of the century. All of this type were intended to act as overseas station ships in the colonies and, as various groups came out, they were each an improvement on their predecessors. The two sisters were launched within months of each other in 1906 and had a deep load displacement of 12 781 tons each and a main armament of seventeen single turrets in a wing arrangement over the casemates. As with their predecessors they were placed on overseas stations and from 1911 onwards were based at Tsing-Tau. Both ships were considered too weak to be part of a battle fleet. Leipzig was a basic pattern light cruiser of a 1901 design for overseas stations. She was upgunned with 15 cm guns at the beginning of the war and had a displacement of 3 756 tons. She had been launched in 1905. Dresden and Emden were also sister ships and were probably to become the most famous in the squadron for their exploits. Built as part of a 1905/1906 programme they were turbine driven and had a deep load displacement of 4 268 tons. Both ships were launched after 1905, Emden in 1906 and Dresden in 1907. The Nurnberg was an earlier (1906) version of the same programme with a slightly lighter displacement. All three were well armed with a main armament of ten 5,2 cm guns. By the standards of the time the ships, although not new, were by no means obsolescent and Von Spee had a very efficient fleet under his command. Regular drills, frequent sea time and frequent gunnery practice had in fact gained the East Asian Cruiser Fleet, a reputation as a 'crack' squadron. Von Spee's immediate worry as war approached in 1914 was Japan's probable position in any forthcoming conflict. If Japan remained neutral von Spee could commence commerce raiding in the Pacific and Indian Oceans with Tsing-Tau as his base and be able to choose his own time to return to Europe via Cape Horn. Should Japan, however, opt to enter the war on the side of the Entente Cordiale it would be taken for granted Japan would immediately attack the nearest German positions and Von Spec would lose his base at Tsing-Tau. Playing it safe, Von Spee put to sea 'on a cruise' about a month before war actually broke out, leaving one ship, the Emden, in Tsing-Tau; Von Spee then disappeared into the Pacific. As war appeared inevitable, the captain of the Emden, Von Muller, also quietly prepared for sea and on 31 July 1914, left Tsing-Tau and positioned himself to attack shipping in the Far East. The Emden then embarked on a short-lived but exciting escapade which has since been the subject of quite a few writings and praise. Von Muller, who gained the reputation of a chivalrous and daring commander, opened the game by capturing a Russian merchant ship, the Rjäsan, as soon as war was declared between Russia and Germany. She then rejoined her squadron briefly which, in the meantime, was being reinforced by colliers and supply ships and, after two days in their company, sailed for the Palan Islands which lie east of the Philippines. Accompanied by a collier she then jinked across to India via Timor, Java and the Lombok Strait, avoiding contact with the British, French and Japanese warships hunting her and safely disguised by the skilful use of wood and canvas. Arriving in the Bay of Bengal she recommenced her career and the guise of a commerce raider with the capture of a Greek collier on 10 September. Von Muller was extremely chivalrous to the survivors of the ships he sank or captured and rapidly built a reputation for himself and his ship as a gallant foe. On 9 November his luck ran out when he was caught by the Australian cruiser HMAS Sydney. The Emden was so badly damaged as a result of the ensuing gun battle that Von Muller beached her on the reefs of North Keeling Island, one of the Cocos Islands. The survivors, however, lived to fight another day by means of an adventurous journey during which they captured first a schooner and then a steamer in which they made their way to Mecca. Crossing Saudi-Arabia, Syria and Turkey they eventually arrived in Constantinople from where they returned to Germany, Turkey being a German ally. A new Emden, displaying an Iron Cross in honour of her namesake was launched in 1916 but failed to live up to expectations and was broken up in 1926. Whilst the Emden was carving her niche as a raider, her sister ship the Dresden was also busy. Well-known for her participation in the international force which intervened in the Mexican Revolution of 1910, the Dresden was in the West Indies when the war commenced. Trying to emulate the Emden she rounded the southern tip of America via the Magellan Strait, encountered the Leipzig and, with her, joined Von Spee's squadron which by that time was at Easter Island. Von Spee then had a full squadron once more and was still undetected. His two main concerns were firstly to avoid the powerful Japanese Navy and, secondly, to find a neutral coast where he could shelter, coal and prepare to break into the Atlantic and home. He decided to head for the southern part of Chile. In London the Admiralty was acutely conscious of the threat posed by Von Spee. The damaged caused by the Emden and a recent setback for the Royal Navy, when the German ships Goeben and Breslau slipped their way through to Turkey to bring that country into the war on the side of Germany, was a spur to action. The Admiralty realized that should Von Spee enter the Atlantic, the Empire's major trade routes would be at risk; he would therefore have to be intercepted before he could do so. The job of stopping Von Spee was given to Rear Admiral Sir Christopher Cradock who was given a squadron with which 'to destroy the Germans'. His squadron consisted of five ships - the cruisers Good Hope and Monmouth, the light cruiser Glasgow, an armed merchant cruiser Otranto and the battleship Canopus. Cradock was to sail as soon as possible from the UK and base himself on the Falklands. The Canopus would not be ready on time but would join him en route. Cradock seems to have taken a long time to assemble his ships, man them with reservists and get away, but by October 1914 he was through the Straits of Magellan and moving up the Chilean coast looking for Von Spee. Cradock was flying his flag from Good Hope, one of those elderly large cruisers (built in 1901) which, being 'too weak to fight and too slow to run away', were usually used for colonial outposts. The Monmouth was a similar type of ship but smaller (9 800 tons compared to 14 150) and was launched in 1901. His best ship was the Glasgow which was launched in 1909 as one of a class of five ships which were the starting point for the Royal Navy's most successful cruiser design. The battleship Canopus was probably the original paper tiger, having been built in 1897 and capable of no more than 13 knots. The remaining ship Otranto was an Orient Line passenger vessel converted into an Armed Merchant Cruiser and armed with eight 4,7-inch guns. With this fleet Cradock was hunting and hoping to find a crack squadron of fairly modern ships, one of which, the Scharnhorst was the holder of the Kaiser's trophy for naval gunnery. One wonders whether Cradock seriously thought that he could defeat Von Spee. His ships were inferior and not as well armed. Their design was poorer in that the German ships had their guns better placed for use in rough weather. His crews were not as well trained. All these things counted against him. On the other hand Cradock was a product of the Edwardian navy which was still glorying in a tradition of Nelson's victories and of defeating impossible odds. Another factor was that one of his fellow cruiser admirals, Rear Admiral Troubridge, had recently been severely reprimanded for not having engaged the 23 000 ton battle-cruiser Goeben with the cruiser Gloucester. Cradock's strategy was, possibly, to slow down or damage Von Spee's ships in such a way that Von Spee could then be brought to bay by heavier ships, sunk by the Canopus' heavy guns or forced to hole up in a neutral port for repairs. Whatever his strategy on entering the Pacific, Cradock sent the Glasgow scouting ahead and had the old Canopus far astern escorting his colliers. The stage was set for the first surface battle defeat by the British at the hands of the German Navy. Towards the end of the month and as they moved north, the Glasgow intercepted a cypher message from the Leipzig. Von Spee had been found! At the same time reports reached Von Spee of the Glasgow looking for him and he immediately steamed south to catch and annihilate her. The strange situation had thus developed where the entire British fleet was chasing after the Leipzig in a northerly direction and the entire German fleet was hunting the Glasgow in a southerly direction. A clash was inevitable and in the early hours of the morning of 1 November 1914, the two fleets were irrevocably destined to meet up during the day. At 14:35 that afternoon by which time the two fleets were labouring through high seas in a strong south-easterly wind, Cradock ordered his ships to open out into a line of search fifteen miles [24 km] apart and to set a speed of 10 knots. This was done, and two hours later Glasgow sighted and reported smoke inshore towards the north-east. A short while later she reported two large ships and a smaller one. The reason for this was that Dresden was tailing 12 miles [19 km] behind her squadron and was, therefore, still invisible, whilst Nurnberg was even further astern. Cradock realized that he had found Von Spee and that he was apparently facing only the Scharnhorst, Gneisenau and Leipzig, a fact confirmed when Von Spee altered course towards the Glasgow . It was some time, however, before Von Spee realized that the Glasgow was not alone and that he had stumbled upon Cradock's fleet. In fact he did not positively identify all his opponents until 18:04. With the odds not so badly against him Cradock formed a line ahead and altered course to cut across ahead of Von Spee thus attempting to put himself between the Germans and the land and silhouetting them against the setting sun. Unfortunately, he lacked the speed to carry out the manoeuvre and, by altering course and increasing speed, Von Spee prevented the movement and, in doing so, pulled ahead of his own squadron. The two fleets ended up 12 miles [19 km] apart and converging. At this stage Cradock decided to attack, which had always been his intention. He had informed the British authorities in Valparaiso that he would attack if he fell in with Von Spee even though he has since been criticised for not falling back on the battleship Canopus 250 miles [402 km] or 24 hours astern. However, he had found his enemy, night was approaching and if Von Spee slipped past him, Cradock would be severely censured. Advising the Canopus that he was going into action, he ordered the Otranto to stay out of the battle and the Glasgow to escape if the battle went against him. He then took the Good Hope and Monmouth against what was now known to be five enemy cruisers. The two armoured cruisers had little hope of victory and the battle of Coronel, as it became known, was a short, sharp and one-sided affair. Cradock's ships made beautiful targets, silhouetted against a glowing red sunset. It was an hour before sunset and the German Fleet was already lost in the murk and shadow of the land for the British gunners. By contrast the clouds had cleared over the westerly horizon and the British fleet was still a clear target. This coupled with the disparity in firepower and experience made a German victory inevitable. Von Spee opened fire at 19:00 at a range of seven miles and the action then soon became general. The Otranto which was completely ineffective got herself to starboard of Glasgow for protection and with that ship took no part in the battle. With the bigger ships it was different. At the third salvo Scharnhorst' s prize gunners found the Good Hope's range and knocked her guns out, one of them before it had even opened fire. Within five minutes Monmouth was being badly hit by Gneisenau whilst Leipzig and Dresden went after the Glasgow , although they also concentrated their fire on the two armoured cruisers to a large extent. The converging courses continued to shorten the distance and by 19:40 the Monmouth was down by the head and on fire aft. The Good Hope, also ablaze amidships turned towards the enemy with the intention of carrying out a torpedo attack, but suddenly blew up at 19:50 and sank at 19:57 with no survivors. At this the British scattered. Monmouth, on fire, sinking and listing badly limped northwards only to encounter the still trailing Nurnberg. The latter immediately put a salvo into her. There was no reply and no surrender, whereupon the Nurnberg re-opened fire and the Monmouth heeled over and sank with all hands and her ensign still flying. Glasgow and Otranto headed west into what was now a dark Pacific. In the days before radar, shadowing was practically impossible and the Glasgow soon slipped and outran her opponents. The Otranto hid in the multiple inlets of the Chilean coast and found her way back to the Atlantic to resume her career as an AMC, ultimately being lost in a collision in 1917. The Glasgow escaped with only splinter damage and made her way to the Falklands in company with the Canopus and then on to Montevideo. Both would soon take part in a revenge action. Von Spee emerged as a sensitive and respected leader, who refrained from crowing over his triumph, and was later honoured by having a new German pocket-battleship, the Graf Spee named after him - a ship which gave even greater lustre to his name. Cradock, who was a studious and thoughtful officer with an honourable record of active service, was probably in what in modern day terms is called a 'no win situation' and today he is forgotten other than as being a good example of getting on with one's duty without counting the personal cost. Thus ended Act One. Stung and insulted by this German victory at sea over the heirs of Nelson, Winston Churchill as First Lord of the Admiralty ordered that von Spee be hunted down, and Admiral "Jackie" Fisher, the First Sea Lord responded immediately by ordering the battle cruisers Invincible and Inflexible to the Falkland Islands under the command of Admiral Sturdee. By sending these two ships Fisher was announcing a vendetta which could only end in the destruction of von Spee's ships if they caught him. These two ships were 'a state of the art' design for their time. The Japanese profiting from the naval victory at Tsushima during the Russo-Japanese war had developed a class of armoured cruisers with 12-inch guns in two twin turrets, a dozen 6-inch guns and a dozen 4,7-inch guns. They had a speed of 20,5 knots and were a match for any contemporary battleship. The plans of one, the Tsukuba were made available to the Royal Navy and were used for the Invincible and Inflexible. The pair were classed as battle-cruisers and were launched in 1907. They were outstandingly successful in this role - heavily armed and with turbines giving them a speed of 25,5 knots. At the time both ships were attached to the Home Fleet from where they were detached to refit and store at Devonport. They left there on 11 November and arrived in the Falklands on 7 December 1914. Fisher also threw a ring of twenty-eight ships around Coronel, seven at Suva in Fiji, four off the West Coast of South America, seven at Montevideo, six at the Cape of Good Hope and four in the West Indies. The British thus blocked von Spee's escape route to the Panama Canal, covered any move back into the Central Pacific, had the shipping route to the River Plate secured, and had the exit into the Atlantic from the Strait of Magellan blocked. The Falkland Islands seemed to Fisher to be the key to stopping von Spee. He felt that the Germans were trying to get back into the Atlantic and thence to Germany and would use the Magellan Strait, the Panama Canal route being a dead give-away of their position. Sturdee thus rendezvoused with Rear Admiral Stoddart and a force of cruisers from Montevideo off the Abrolhos Rocks off the coast of Brazil, and with this powerful fleet pushed on to take up a position off the entrance to the Strait of Magellan. First port of call was Port Stanley in the Falklands to coal and, as already mentioned, the force arrived there on the night of 7 December. There they joined the Canopus, which had been ordered to act as a gun battery to defend the port by putting herself aground and positioning her lighter armament ashore. Sturdee thus had in addition to the Inflexible, Invincible and Canopus the light cruisers Glasgow (the Coronel survivor) and her sister Bristol and another two sisters, Cornwall and Kent. These ships all entered Port Stanley and commenced bunkering. Von Spee in the meantime found himself relatively undamaged, but with depleted stocks of coal and ammunition and lying off a small port in Chile. He thus decided that, instead of doubling back into the Pacific or using Panama, he would round Cape Horn as the action least expected of him and attack Port Stanley, the coaling station in the Falklands. After a rough passage he arrived off Port Stanley at 08:00 on the morning of 8 December 1914. The British had got there less than 12 hours before him. The first intimation of this was when the shore look-outs in the hills above Port Stanley signalled the arrival of the Germans. Sturdee was immediately placed at the disadvantage of being bottled up in harbour where his ships could have been picked off one by one as they sailed out of the entrance. Von Spee however was confident of surprise and had no knowledge of Sturdee. He was intent only on coaling and destroying the radio station and the dense clouds of black smoke being pushed out by Sturdee's ships as they desperately got up steam was mistakenly and confidently taken as being the British burning their coal stocks to prevent them falling into German hands. Instead of increasing speed to block the entrance von Spee cruised comfortably on until his startled look-outs picked out the outline of a series of tripod masts in amongst the smoke. Von Spee immediately realized that he was up against a modern and heavy force and immediately turned away. At the same time Canopus opened fire and battle was joined. As von Spee ran for safety each of the British ships got herself under way until at 10:00 the only ship left in the harbour besides the Canopus was the Bristol which was doing engine repairs and would try and catch up later. Even with a 15 mile start there was no way in which von Spee could escape. His ships needed a bottom clean and were no match speedwise for his more modern opponents and the British only had to ensure he did not give them the slip at nightfall. Just after lunch at 13:00 the Leipzig's stokers began to fail and the Inflexible ran her down into gunnery range and opened fire. Thus brought to bay von Spee turned the Scharnhorst and Gneisenau around to go to Leipzig's assistance, whilst his light cruisers continued running. The faster, heavier and more powerful British battle-cruisers easily stayed out of his range whilst pounding his ships to pieces and at 16:17 the Scharnhorst was sunk. By 18:00 the Gneisenau had taken a terrific battering and also went down in the freezing Atlantic. There were only 200 survivors from both ships. In the meantime the British cruisers, glorying in the role for which they were designed went hell for leather after their German counterparts. The Kent, already 14 years old, later claimed to have reached 25 knots in catching the Nurnberg, thus exceeding her designed speed, whilst the Glasgow thirsting for revenge for Coronel and the Cornwall easily ran down the Leipzig. In the confusion no one went after the Dresden and by nightfall she was the sole survivor of the famous squadron. With a high degree of cunning she slipped into the maze of islands and channels in the vicinity of Tierra del Fuego where she was able to hide for three months. Moving from inlet to inlet using intelligence supplied by the German immigrant settlers in the vicinity she was eventually given away whilst hiding near Juan Fernandez at Mas Afere island off the coast of Chile. Her old enemy Glasgow accompanied by Kent and the armed merchant cruiser Drama were sent to sink her and found her inside Chilean territorial waters. As she was illegally breaking Chilean neutrality they commenced shelling her into submission until the Germans called for cease-fire negotiations. One of the negotiators was Lt Wilhelm Canaris, who although unsuccessful as a negotiator then went on to become an Admiral and Chief of German Counter Intelligence. The negotiations failed and the captain of the Dresden scuttled her to avoid her capture. Peace descended on the far South Atlantic again, but the two battles as this article attests have not been forgotten. The Germans launched a new Emden and a new Nurnberg in 1916. The first has already been described and the latter sank ignominously in 1922. There is a Cornwall, Glasgow and Bristol in the Royal Navy right now, not to mention Invincible. Scharnhorst and Gneisenau were names to be reckoned with in the Second World War but possibly Maximillian von Spee would have been extremely proud of the ship named in his honour and which also gained fame in the South Atlantic - the Graf Spee. It is also highly possible that the ship was better known than the man for whom it was named; the victor of the only conclusive sea battle won by Germany over the British. Barnet, C. The Great War. Peerage Books. Gray, R. ed. Conways All the Worlds Fighting Ships 1906-1921. Naval Institute Press. Preston, A. Cruisers. Prentice Hall. Warner, O. Great Sea Battles. Spring Book Books. 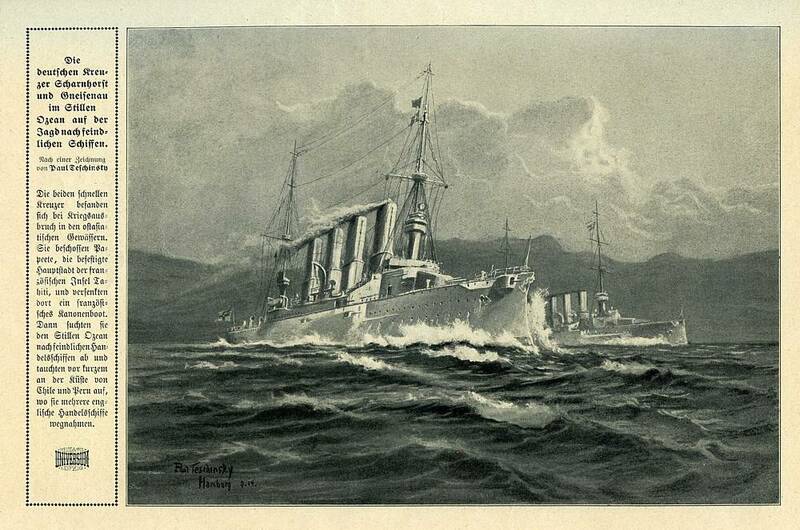 Cradock’s nemesis, Vice Admiral Maximilian Graf von Spee’s East Asiatic Squadron, on 8 December 1914 off the Falkland Islands. The Admiralty acted quickly to avenge Cradock’s defeat, to restore the Royal Navy’s prestige and to protect the trade routes. The instruction was clear: “... essential recover control. First Sea Lord requires Invincible and Inflexible for this purpose”, read the telegram to Jellicoe on 5 November, “Sturdee goes C.‐in‐C. South Atlantic and Pacific”. Gneisenau and three light cruisers Dresden, Leipzig and Nurnberg.